As you know you can flash Coolpad Dazen phone using YGDP flash tool and the flashing process will complete without any errors, but some of the Coolpad Dazen 1 8297L-100 or 8297L-I00 phone failed at 11% with the same YGDP Tool. There are some working methods to recover or unbrick the Coolpad Dazen 1 phone and here we will describe all possible solutions to unbrick the Coolpad smartphone or to recover the Coolpad Android smartphones. Please follow the below Methods to solve the YGDP Flashing failed at 11%, while flashing Coolpad phones. As you know Coolpad has Qualcomm CPU and can be flashed firmware using YGDP Tool and QFIL flash tool. Coolpad Dazen Firmware, Coolpad Dazen Flash Tool Download links also provided in this tutorial. To Solve flashing process failed at 11% please follow the below methods. How To Flash Coolpad Dazen Phone Using YGDP Tool? How To Recover Dead Boot Coolpad Dazen Phone Using microSD Card? 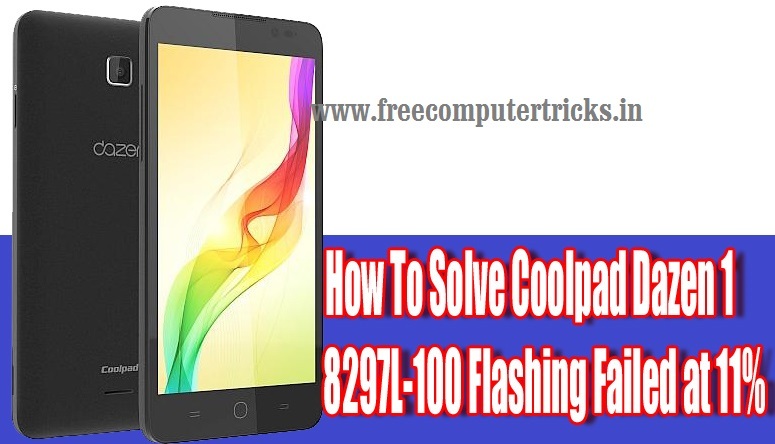 How To Flash Coolpad 8297L-100 Using QFIL Flash Tool? All Android Smartphones FRP Bypass Solution Here. Charge the Battery at-least to 50% or more. Now Flash the phone using YGDP Flash Tool. Hold Volume Up Key and insert USB cable to the phone. For complete process to flash the phone using YGDP Tool and Download Firmware and Flash Tool, Please Visit Here. Download .CPB Firmware and Extract it Using YGDP Flash Tool. Open QFIL flash tool and flash the phone. To Know more about flashing with QFIL Flash Tool Please Visit Here. How To Flash .CPB File With QFIL Flash Tool? As you know .CPB firmware file can only be flashed with using YGDP flash tool, but do you know you can also flash the .CPB stock ROM using QFIL flash tool, which required prog_emmc_firehose.mbn and XML File rawprogram0.xml and patch0.xml. Here we will show how you can extract the .CPB firmware and flash with QFIL Flash Tool. Open YGDP Flash tool and Load the .CPB firmware. When firmware loading process complete, don't close the flash tool. Now go to the YGDP tool folder and find extracted firmware folder. The name of the extracted firmware will be 8297L-100 or you can check any other folder to find the extracted firmware. Now copy the folder to your Desktop and close the YGDP flash tool. Then open the QFIL flash tool and select .mbn file and .xml file. Now flash the phone with EDL mode. So in this way you can recover the Coolpad phone and solve the flashing process failed at 11%. If the phone is dead when flashing it using YGDP flash tool then you can recover the dead boot Coolpad phone using Memory Card Method [SD Card Method Here]. If you still facing problem to solve the flashing failed error at 11%, then the phone must have some hardware fault. Note: Although this methods are tested and working fine, but we are not responsible for any damage happens to the phone. This topic is only for tutorial purpose.